Should you go to a chiropractor? Take this two-minute survey and find out. 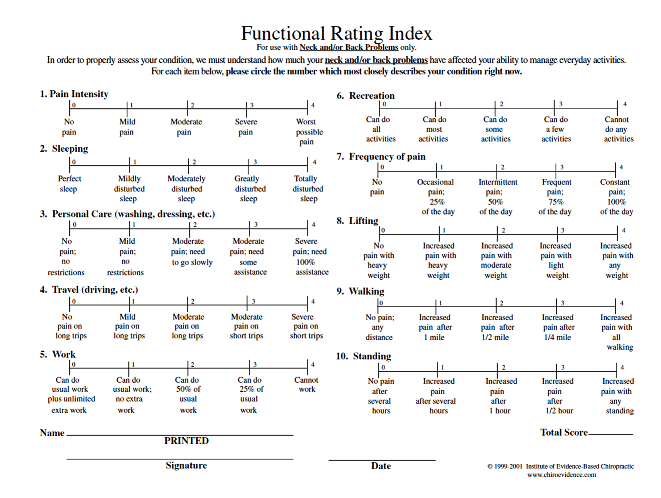 CLICK HERE or on the image below for a Functional Rating Index. This is a valid and reliable patient assessment tool that we use to monitor neck and/or back pain problems, as well as problems like headaches, fibromyalgia, and extremity injuries. Simply print out the form and fill it out based on how you are feeling today. Circle the number which best describes each question. Circle the whole number only, not anywhere in between. This typically takes less than two minutes. If your score is 0-4, you do not really need to go to a chiropractor at this point. If your score is 5-9 you would likely benefit from going to a chiropractor. If your score is 10 or more, you really should consider going to a chiropractor. Call us today if you would like to schedule an appointment.